Offer must be booked 30 days in advance. Reservations are fully pre-paid, non-refundable and non-cancellable. Blackout dates, restrictions, taxes, additional fees and charges may apply. This offer is not available over home football game weekends or for group bookings. Cannot be combined with other offers. This is a limited time offer available for new reservations Not applicable to groups, corporate-negotiated, or third party rates. Cannot be combined with any other promotion or offers. Subject to availability and blackout dates. Taxes and gratuities are not included. Flexible travel schedule? Extra perks over select dates! 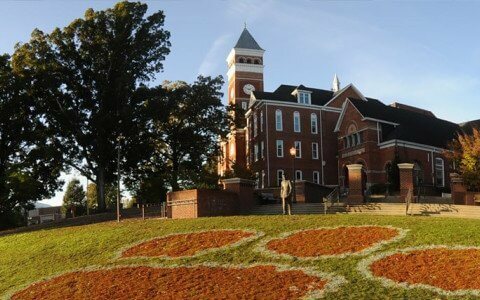 Our Old Greenville Highway location puts you in close proximity to Clemson’s beautiful 1,400-acre university campus. In fact, you can hear the Tillman bells from here! The Abernathy is anchored in the highest ideals of Clemson University. Whether you’re a football fan, returning alum or first-time visitor, you’ll feel surrounded by the tradition, spirit and Southern charm of the university. Our generously-sized guest rooms are thoughtfully designed with your comfort in mind. From sitting areas with sleeper sofas to fully equipped wet bars featuring a microwave, refrigerator, and Keurig, our rooms really are a home away from home. Clemson sits at the edge of Lake Hartwell, our man-made reservoir and a favorite spot for kayaking, swimming, boating, water-skiing, and fishing. It’s surrounded by more than seven miles of hiking and biking trails, too. Whether you’re visiting Clemson for the first time or you’re a regular, we’ll greet you with a welcome that’s warm and genuine. When we ask “What brings you to Clemson?,” we mean it.